By RANZCOG Intrapartum Fetal Surveillance (IFS) Guideline 20141 definition, a fetal bradycardia is a fetal heart rate (FHR) below 100 beats per minute (bpm) for more than five minutes. This is a simple definition and one which is reasonably consistent in the literature. In a practical sense, however, a fetal bradycardia may be usefully thought of as being either hypoxic or non-hypoxic in origin. In the RANZCOG Fetal Surveillance Education Program2 (FSEP) we refer to the non-hypoxic fetal bradycardia as a baseline bradycardia. In other words, a fetus with a bradycardia not attributable to hypoxia. Given the RANZCOG IFS Guideline defines the normal baseline fetal heart rate at 110–160bpm, this would also include the fetus with a baseline fetal heart rate between 100 and 110bpm. The more common causes of a (non-hypoxic) fetal baseline bradycardia would include a mature parasympathetic system (Figure 1), maternal medication (high-dose beta blockers), a fetal cardiac conduction defect (heart block), or, occasionally, what turns out to be the accidental monitoring of the maternal heart rate, particularly in active labour. These fetuses, and indeed the mother, will generally display one or more physiologically reassuring features, such as regular movement, normal baseline variability, accelerations or even simple decelerations. While a fetal heart block or the accidental monitoring of the maternal heart rate may ultimately have consequences for fetal wellbeing; they are not the focus of this article. The antenatal cardiotocography (CTG) in Figure 1 was recorded from a primigravid woman at 41+4 weeks gestation. She was being monitored for post-dates. The AFI was reported at 12cm. With a baseline fetal heart rate of 90–95bpm, normal baseline variability and accelerations, this is a well-oxygenated fetus. However, it is an abnormal CTG by definition. In the absence of maternal medication, the baseline bradycardia is most likely the result of a mature parasympathetic nervous system. The fetus is well. Figure 1. Fetal baseline bradycardia. eliminate the uterine activity, if present, with 250μg SC terbutaline (or equivalent). More specific management, including delivery, will largely be determined by the overall clinical picture, an assessment of the physiological basis of the bradycardia and the response to first-line management. A vaginal examination should be performed to assess progress, exclude a cord prolapse, facilitate the application of a fetal scalp electrode and determine the possible mode of birth. Where the physiological basis of the fetal bradycardia is uncertain, consideration should be given to a sentinel event such as an abruption or uterine rupture. The more common causes of sustained fetal hypoxia and subsequent bradycardia include uterine hyperstimulation (by tachysystole or hypertonus),4 maternal hypotension (positional, procedural or anaesthetic),5 sustained umbilical cord compression, including cord prolapse, or a rapid descent of the fetal head through the pelvis. Less common causes may be placental abruption, placental infarction, uterine rupture or maternal hypoxia. Fortunately, most fetal bradycardias do have a straightforward cause and are amenable to appropriate management without an emergency caesarean birth. In recognition that some bradycardias are of unknown aetiology, reasonably, preparation for an operative delivery should form part of the overall management strategy in these cases. This is particularly important where there might be a delay in opening an operating theatre, such as in a smaller hospital out-of-hours. Planning ahead is key in these circumstances. Too often the ‘unknown aetiology’ of a bradycardia is simply poorly recorded uterine hyperstimulation. 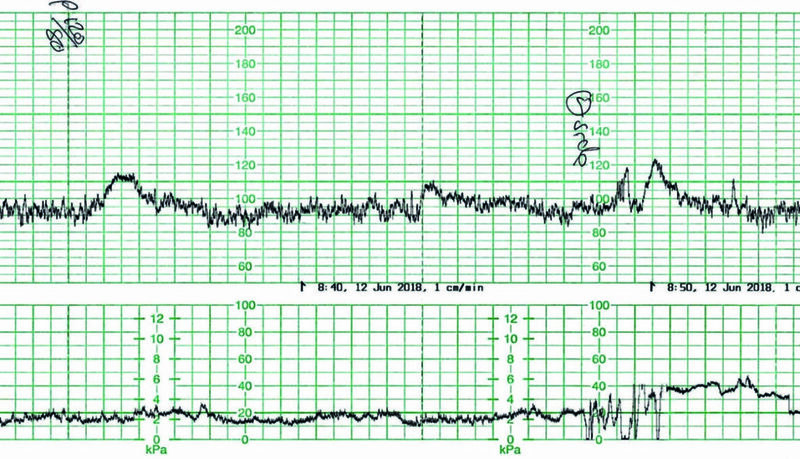 Clinicians typically work hard to ensure a high-quality fetal heart rate pattern is well recorded, but this is not always the case with uterine contractions. The maternal habitus can play a part in this and the role of the intrauterine pressure catheter, though effective, is not well defined. Figure 2 shows such an example, where a primigravid woman at 39+6 weeks gestation was being augmented with Syntocinon for slow progress. There were no other known risk factors. 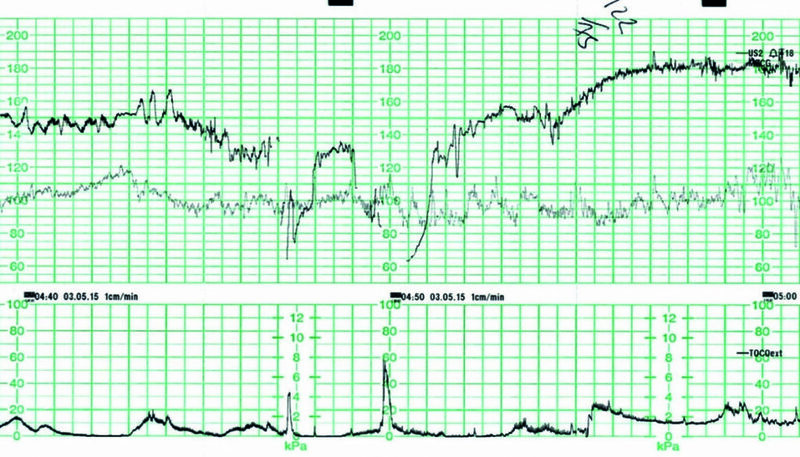 The prior CTG demonstrated a baseline fetal heart rate of 145bpm with normal baseline variability. There were occasional accelerations. There were isolated variable decelerations noted, down 30–60bpm, lasting 45–60 seconds. The uterine activity was recorded at 3–4:10 strong. Figure 2. Fetal bradycardia due to (poorly recorded) uterine hyperstimulation. Management included maternal repositioning and ceasing the Syntocinon. A vaginal examination at 04:50hrs revealed a thick anterior cervical lip and the fetus in the direct OP position. A post-deceleration overshoot is apparent as the fetus compensates for the period of hypoxia. The woman was transferred to theatre for a caesarean birth and the baby was born in good condition. Umbilical cord arterial and venous lactates were within the normal range. 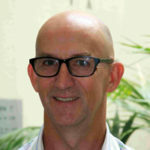 Later assessment and discussion regarding the CTG centred on the fact that, while the contractions were recorded at 3–4:10 strong and appeared ‘modest’ on the CTG, most were lasting in excess of two minutes. Tocolysis was not considered at the time and fortunately was not required. This uterine activity should have been described as uterine hyperstimulation (by hypertonus)6 and conservative management could have been considered earlier. Figure 3 was recorded from a multigravid woman at 40 weeks gestation. She was being monitored following a deceleration noted on auscultation. The woman repositioned to all fours as a result of increasing bowel pressure. While assistance was called for and preparation was being made to expedite birth, a spontaneous birth resulted. 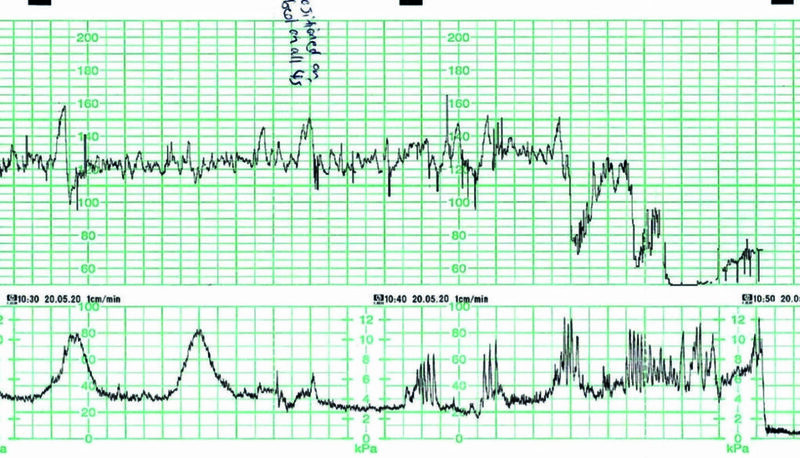 The CTG prior to the bradycardia is highly predictive of a well oxygenated fetus and the baby would be expected to be in good condition at birth. The baby was born slightly ‘stunned’ at 10:50hrs with Apgar scores of 7 and 9. No resuscitation was required. Umbilical cord lactates were not performed. Figure 3. Fetal bradycardia due to rapid progress/descent/birth. Figure 4 was recorded from a primigravid woman being induced at term for reduced fetal movements. Cervical ripening was undertaken by balloon catheter. The pre- and post-balloon catheter CTGs were normal. An artificial rupture of membranes was performed with clear liquor draining. A Syntocinon infusion had been commenced approximately two hours earlier. 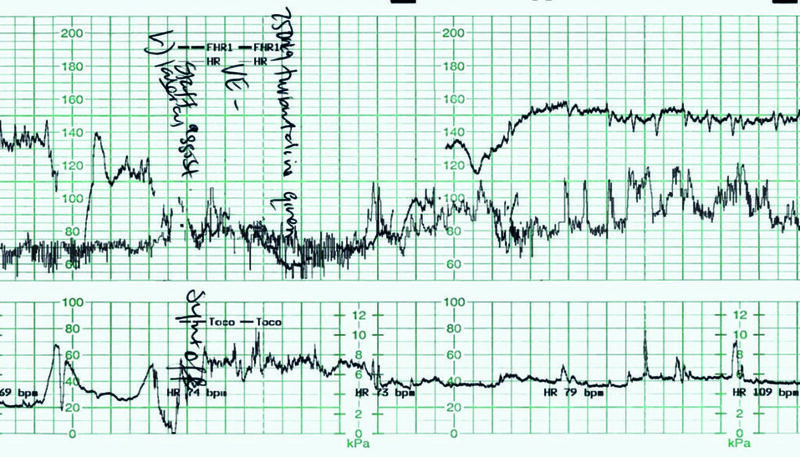 The prior CTG demonstrated a baseline fetal heart rate of 130–135bpm with normal baseline variability. There were no accelerations. There were isolated variable decelerations noted, down 30–40bpm lasting 30–45 seconds. Uterine activity was recorded at 3–4:10 strong. Management in this case was timely and appropriate. The mother was initially repositioned and the Syntocinon infusion ceased. A vaginal examination was performed, revealing a cervical dilatation of 5–6cm and no umbilical cord apparent. Terbutaline 250µg was administered subcutaneously, while preparation for a caesarean birth was underway. A post-deceleration overshoot of the fetal heart rate is again apparent. The fetal response negated the need for an emergency delivery. The Syntocinon was recommenced approximately one hour later, once the baseline fetal heart rate and baseline variability had returned to normal. With most of the uterine contractions lasting 90–120 seconds, a contraction rate of 3:10 was maintained with judicious Syntocinon use. An assisted vaginal delivery approximately six hours later was the final outcome, with the baby born in good condition. Arterial and venous umbilical cord lactates of 6.7 and 4.4mmol/L were recorded, within the normal range for a vaginal delivery. While there are contraindications to terbutaline/tocolysis use, such as placental abruption or maternal cardiac disease, it is probably an underutilised tool in our management of uterine hyperstimulation. Side effects of a maternal and fetal tachycardia are expected. Concerns regarding uterine atony and excessive bleeding as a result of terbutaline use are not supported in the literature and, with a very short half-life, are unlikely. Importantly, terbutaline does not stop labour, but facilitates intrauterine resuscitation and ‘buys’ time for management decisions. With a short half-life, most women will recommence contractions within 15 minutes, providing clinicians with a fetal ‘stress test’ to aid management decisions. Although some fetal bradycardias are ultimately not amenable to management, those are in the minority. Of those that are amenable to appropriate management, many are the result of uterine hyperstimulation. With most well-grown, term fetuses requiring at least 60–90 seconds of uterine ‘rest’ between contractions to maintain adequate oxygenation, maternity care providers should be aware of the importance of properly assessing, not just the contractions, but the break between them. It is the break between contractions that counts, not counting the contractions! Clinicians should also be familiar with their protocol for tocolysis, because uterine hyperstimulation will occur. 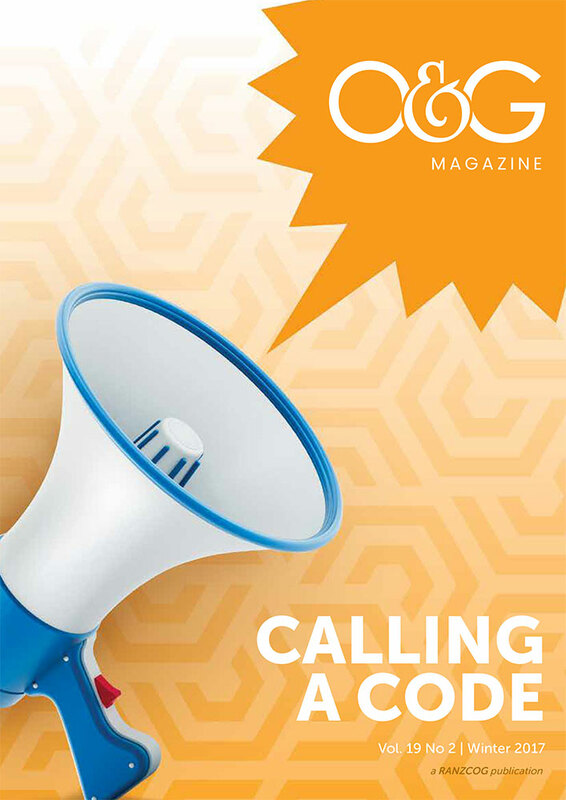 Royal Australian and New Zealand College of Obstetricians and Gynaecologists. 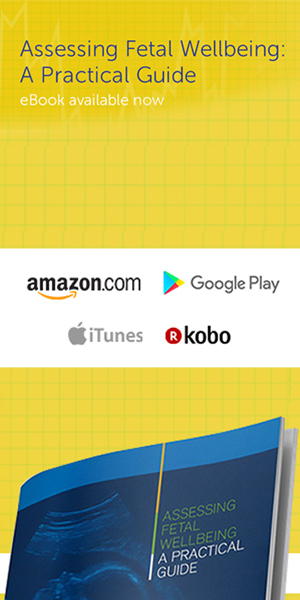 Intrapartum Fetal Surveillance Clinical Guideline Third Edition. East Melbourne, Victoria: RANZCOG, 2014. Edward T. Riley MD Labour analgesia and fetal bradycardia. Canadian Journal of Anaesthetics 2003 / 50: 6 / pp R1–R3.